The ECRL project is awarded to China Communication Construction Co Ltd (CCCC) without an open tender at a price of RM 55 billion with financing via soft loans from the Export-Import (Exim) Bank of China. Malaysia and China signed a framework financing agreement and engineering, procurement, construction and commissioning contract in Beijing on 1 Nov 2016, in the presence of Prime Minister Najib Razak and his Chinese counterpart, Li Keqiang. This price tag of RM 55 billion for 600km rail or RM91.7 million per kilometer is extremely high. One of The Edge articles described the ECRL as the world’s costliest railway of its class. Let’s make some comparisons with other similar rail projects. CCCC has done similar railway projects in Kenya at RM61.4 million per kilometre. At RM 91.7 million per km, the ECRL is about 50% more expensive with the same contractor. Another China's state owned enterprise, China Railway Construction Corp was awarded RM14.65 billion contract for the construction of 215km Padma Rail Line in Bangladesh. This works out to RM 68.1 million per kilometre. The ECRL is about 34% more expensive than Padma Rail Line, which actually includes the construction of 66 major bridges, 244 minor bridges and the procurement of 100 passenger coaches. Another project in Ethiopia of which 40% of the 375km project to be built by a Turkish contractor, Yapi Merkezi on challenging terrain cost only RM18.1 million per kilometer, which is five times cheaper than the ECRL. Comparing it with another local project, the 179km Gemas-Johor Bahru link was awarded to China Railway Engineering Corporation in December 2015 for the sum of RM7.1 billion or RM39.8 million per kilometre. At RM 91.7 million per km, the ECRL is 130% more expensive than Gemas-Johor Bahru link. Minister Datuk Seri Abdul Rahman Dahlan tried to justify the RM 55 billion price tag by comparing the ECRL project’s cost to the Golthard rail project in Switzerland, the Madrid-Valladoid and the Barcelona lines in Spain. However, those were nearly 100% rail tunnel projects and they were all high-speed rail travelling up to 300 kilometer per hour whereas the ECRL only has a short range of rail tunnel (18km out of 600km) through Titiwangsa range and it is a conventional rail with traveling speed of only 170 kilometer per hour. According to the interviews reported by The Edge, local industrial players believe that the ECRL project is overpriced even after taking into account the tunnel through the Titiwangsa range. They estimated the project cost at the range of RM 32 billion to RM 36 billion. In fact, the East Coast Economic Region Development Council (ECERDC) CEO, Datuk Jebasingam Issac John was quoted in the newspaper in April 2014 that the ECRL project will cost around RM30 billion. Why did the price increase more than 80% after just 2 years? 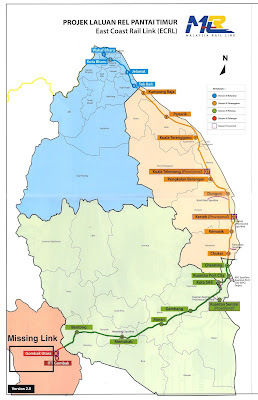 Additionally, HSS Integrated Sdn Bhd, which completed the feasibility study of the ECRL project in December 2015, disclosed in its Corporate Profile and Capability statement that it studied the original proposed the ECRL route of 545km long and the project will cost RM 29 billion or approximately RM53.2 million per kilometer. Why an additional 10% in length to 600km now resulted in more than 80% increase in the cost of project? When Pakatan Harapan members of parliament demanded the federal government to disclose the ECRL’s feasibility study prepared by HSS, which also includes an economic study, they were given the cold shoulder. According to CCCC press statement on 1 Nov, the contract value of the ECRL signed between Malaysia Rail Link (MRL) and CCCC in Beijing was RM 46 billion. However, as reported in the news media, the federal government obtained a loan of RM 55 billion from The Exim Bank of China for the project. Where does the excess go? Sarawak Report documented how the inflated ECRL contract and extra borrowings will be used to plug the hole of 1MDB especially to settle 1MDB problems with the International Petroleum Investment Corporation (IPIC). Can this be a repeat of 1MDB’s scandal of borrowing approximately RM18.3 billion in the name of power plants acquisition but the real acquisition cost for the Tanjong Power and Genting Sanyen power plants was actually only RM10.8 billion with the remaining borrowed monies being siphoned out? About 80km of the 600km ECRL is in Selangor. The ECRL is currently doing a public display in the Surahanjaya Pengangkutan Awam Darat (SPAD) headquarters as required under the S.84 of the SPAD Act. To my surprise, only 16.7km of Selangor portion from Titiwangsa range to Gombak is in the display, a big portion of the Selangor part of the ECRL is left out from the public display. According to the SPAD personnel there, the “missing link” from Gombak to Port Klang, which is at least another 60km, will be in the second phase of the project. If the Kuantan-Port Klang connection is important, why is it that the Gombak-Port Klang route not in the public display? 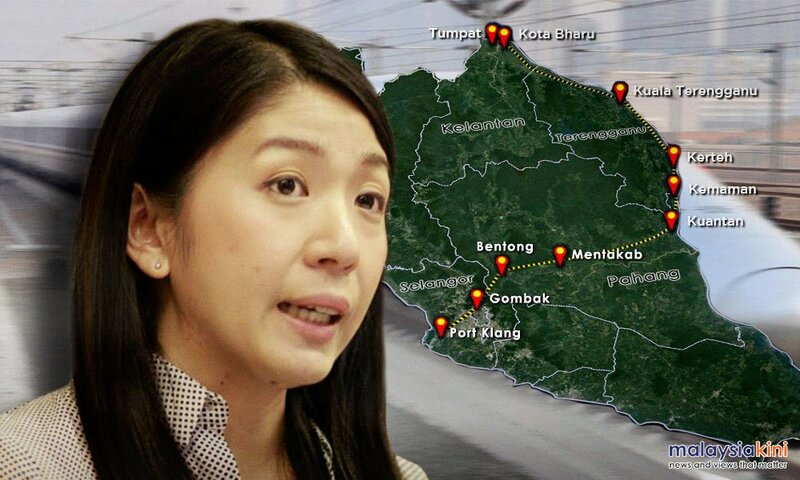 Is it to avoid the Selangor state government from having any say in the project? Does the federal government want to exclude Selangor state government from the decision-making process and start the project in other states first then later on push it down our throat whatever their plan is? So far, the federal government only had one meeting with Selangor state government regarding the project. Once the alignment in Selangor is finalized, probably around 1000 pieces of land need to be acquired to build it. It will give a lot of economical and social impact to the people of Selangor, hence the Selangor state government and Selangorians deserve to be better informed about the planning and implications of the project and most importantly we need to be a part of the decision-making process. iii. the estimated riderships and the future price for passengers’ train tickets and cargo transportations to make the project at this price tag economically viable. With the information available from the documents above, the people can then judge if the project is fairly priced with proper financing procedures. The Selangor state government has authorities in land acquisition and local authorities for the 80km ECRL in Selangor; hence I raised the issue in the state assembly on 30 March 2017 to call upon the state government to flex its muscles to demand the above documents from the federal government before any cooperation from the state government is given. Menteri Besar Azmin Ali has agreed to lay out these demands to the federal government the next time when the federal government meets with the state government regarding the project according to Section 20A of the Town and Country Planning Act 1976. As a matter of fact, the disclosure of the documents is not good enough. The federal government should do an open tender for the ECRL project to avoid the project being outrageously overpriced. We are always open to infrastructure projects but it must be done in a transparent and economically viable manner and should not be a tool for politicians to milk future generation’s monies in the name of infrastructure. As of now, the ECRL has a questionable price tag, financing and implementation. As I’ve mentioned previously, when the prices of passenger train tickets and cargo transportation are not competitive as a result of a bloated project cost, the ECRL will likely become under-utilised and become an expensive white elephant. Malaysia can’t afford another expensive white elephant and definitely can’t afford to be the next Sri Lanka.